More than 10 years ago Andiamo’s baby restaurant Adesso settled next to the flower sellers on Rondebosch Main Road. I was still in high school then so my Mother and I decided to visit on a girls’ day out. Their display windows were filled with fresh salads, pickled vegetables and freshly made pastas ready to go. It was at this counter that I had my first artichoke! On this day I also selected lasagne, one of my favourite dishes of all time. After eating it at home I found it rich with the different layers of flavour. I asked my Mom, “Why does this lasagne taste so different? It’s very filling!” She told me that proper Italian food is filled with flavour and has a rich layers that builds up. I never forgot this about good quality food. Over the years I continued to eat the lasagne but I moved on and over time the Adesso disappeared. I heard that there may be others in Cape Town but I never came across one, until last night. 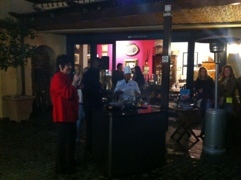 BCTC was invited by Andiamo to an evening at the Cape Quarter. 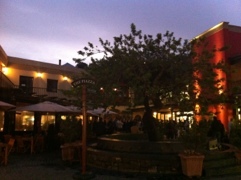 In fact, I didn’t know the Piazza was part of the Cape Quarter, I hadn’t been there for years! It was a cold and drizzly evening but the prospect of art, wine and chocolate was enough to persuade me to pop in for a bit. I arrived and numerous people were meandering around the piazza. 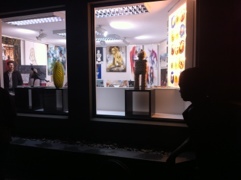 I first visited the Lisa King Gallery which had so many great works of art. I studied art in high school and always love to see what others do. 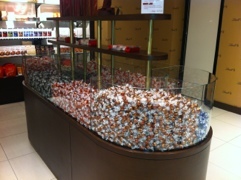 The Lindt store was next door – I didn’t even know this store existed and my goodness was it like Mr Wonka’s factory! 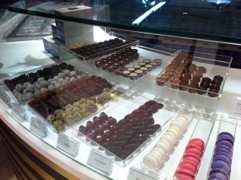 Shelf after shelf of gorgeous chocolates, all looking so beautiful and delicious especially in the cold weather. They had INSANE specials on so I went mad – 3 bars of chilli chocolate slabs for the price of 1 and buy 1 bar get two free of other selected flavours. It cost me R75 for 6 bars of Lindt chocolate, wow! Next I watched the Giggling Gourmet Chef charm the audience with her warm and enthusiastic cooking demonstration, calling members of the audience, away from their Fairview cheese and wine, to participate. The photographic exhibition was right next to the cooking display so I squeezed in and took a look. There were some truly beautiful photographs. I was moved by a picture of a mother and baby rhino under a tree, the melted wall paper from houses that remind me of the Namibian ghost town Kolmanskop and another that looked like the trees were literally moving. Really stunning. 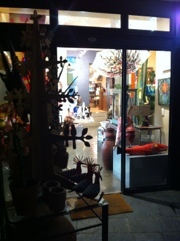 I finished my stroll and evening by visiting Andiamo. From the moment I stepped into the restaurant my senses were blanketed by the beautiful buttery, garlicy and singed edges of wood fired pizza, it smelt so good! I walked through looking at the various produce on sale but my eye was pulled to the display window whilst I scoured for a glimpse of artichokes! I joined my hosts and soaked up the warm environment, rich smelling pizzas and pastas warming the restaurant with its delicious aroma and flavours. I enjoyed a little white wine in the warm restaurant, listening to the buzz of couples and friends. The service was polite and attentive with ample large tables for all numbers and enough wine to keep dinners merry. I can imagine Andiamo is gorgeous during summer time, tables set out in the courtyard under the trees and blue sky, but since I can only comment on visiting during winter, I can certainly recommend visiting during the cloudy season. Pizza and pastas are always a temptation during the cold wintery nights so if you’re considering going out on a dinner date or hanging out with friends, suggest Andiamo to your group. Find Andiamo in the Cape Quarter Piazza on the left side of Dixon road (opposite the main center). Next articleWi-Fi Hits Flights on South African Airline: Mango! Rate Your Favourite Salons with Pretty Smart!